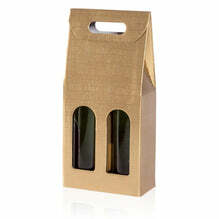 Carrying carton for three bottles of wine or champagne up to 340mm length. 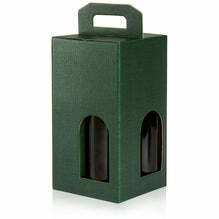 Seta packaging has a demanding surface with structural embossing. This gives you a noble look and scratch resistance. Feel the difference! Subscribe and never miss out on our new product additions and promotions. Most of our products are delivered FREE to the Mainland UK. Please see the individual items where the carriage is charged separately - these are typically Box Filler and Rigid Boxes. We aim to deliver your order right away. We will normally send your order to you within 10 business days. Deliveries are Monday to Friday during office hours with no specified timing schedules. If you require a specific booking in time please advise and we will quote any extra charges incurred. Deliveries to bonded warehouses may incur a surcharge and we will advise before processing your order. If you have a booking-in system please advise at the time of ordering and advise on a delivery slot along with booking reference. Failure on your part to maintain the delivery slot and any delay in off-loading may result in additional costs from the delivery agent which will be passed on accordingly. Any charges incurred by us from our delivery agents for failed delivery attempts and returns will be passed on to you. Palletised orders are delivered as a kerbside service only.